قمری, اخلاص, طلیسچی, غلامرضا, دژدار, امید. (1396). رویکردی تحلیلی به بررسی جنسیت و تفاوت‌های آن در ادراک فضای کالبدی، نمونه موردی: فرهنگسراهای شهر تهران. معماری و شهرسازی آرمان شهر, 10(21), 77-86. اخلاص قمری; غلامرضا طلیسچی; امید دژدار. "رویکردی تحلیلی به بررسی جنسیت و تفاوت‌های آن در ادراک فضای کالبدی، نمونه موردی: فرهنگسراهای شهر تهران". معماری و شهرسازی آرمان شهر, 10, 21, 1396, 77-86. قمری, اخلاص, طلیسچی, غلامرضا, دژدار, امید. (1396). 'رویکردی تحلیلی به بررسی جنسیت و تفاوت‌های آن در ادراک فضای کالبدی، نمونه موردی: فرهنگسراهای شهر تهران', معماری و شهرسازی آرمان شهر, 10(21), pp. 77-86. قمری, اخلاص, طلیسچی, غلامرضا, دژدار, امید. رویکردی تحلیلی به بررسی جنسیت و تفاوت‌های آن در ادراک فضای کالبدی، نمونه موردی: فرهنگسراهای شهر تهران. معماری و شهرسازی آرمان شهر, 1396; 10(21): 77-86. 1کارشناس ارشد معماری، دانشکده هنر و معماری، دانشگاه آزاد اسلامی واحد همدان، همدان، ایران. 3استادیار معماری، دانشکده هنر و معماری، دانشگاه آزاد اسلامی واحد همدان، همدان، ایران. هدف تحقیق حاضر، رسیدن به آیتم‌های ضروری در طراحی فضایی معماریست، که برای هر دو گروه جنسی کاربر فضا طراحی شده باشد. چنین فضایی، محصول توجه به تفاوت‌های ادراکی دو جنس استفاده‌‌کننده از فضا می باشد. ادراک فضا، از مهم‌ترین و پیچیده‌ترین ابعاد شناخت و سنجش فضا می‌باشد. یکی از ابعاد مهم تفاوت‌های فردی انسان‌ها، جنسیت است و به‌نظر می رسد که جنسیت با نگرش‌های افراد و ادراک آن‌ها از پدیده‌ها رابطه داشته باشد. در نتیجه چنین تفاوت‌هایی، ممکن است افراد مختلف در رویارویی با فضا ادراک متفاوتی نسبت به یکدیگر داشته باشند. چنین موضوعی مستقلاً کمتر بررسی شده است و نتایج چنین آزمایش‌هایی می‌تواند تأثیر قابل توجهی در ارتقاء کیفیت محیط‌های انسانی داشته باشد. این مقاله درصدد پاسخگویی به پرسش‌های زیر است: آیا بین جنسیت و ادراک فضای کالبدی رابطه‌ای وجود دارد؟ و در ادراک فضای کالبدی توسط جامعه آزمودنی، بین دو جنسیت، تفاوت معناداری در توجه به ویژگی‌های فضا وجود دارد؟ فرهنگسراهایی در تهران انتخاب شده‌اند و گروه‌های پاسخ‌دهنده مؤنث و مذکر به منظور سنجش مفاهیم ادراکی فضا مورد استفاده قرار گرفته‌اند. روش پژوهش، آزمون افتراق معناییست. براساس نتایج حاصله، افراد در رویارویی با محیط، به تمام جنبه‌های فضای معماری، مقولات بصری، روانی، ادراکی و عملکردی توجه دارند. بنابراین باید در طراحی به تمام جنبه‌های ادراکی کاربران و تفاوت‌های آنان توجه نمود. این امر باعث ادراک کامل‌تر و خاطره‌انگیزی آن فضا شده و کاربران بهتر و با کیفیتی بالاتر با آن ارتباط برقرار کرده و زمان بیشتری را با رضایت خاطر در آن سپری می‌نمایند. از یافته‌های این پژوهش می‌توان به تفاوت‌های ادراک زنان و مردان از فضای کالبدی دست یافت و با رعایت آن‌ها در طراحی فضاهای عمومی، به ارتقاء کیفیت حضور هر دو جنس در فضا کمک کرد. Ardeshiri, M., Hjipour, K. & Hakimi S. (2013). The Role and Position of Physical Structure of Urban Neighborhoods Relating the Formation of Social Capital. Research and Urban Planning Journal, 13, 35-56. Bagheri, A. (2009). Comparing the Traditional and Contemporary Neighborhoods. Conference of Neighborhood Development. Concepts and Theoretical Approaches, Tehran Municipality, Social and Cultural Deputy, 53-88. Barton, H., Grant, M., & Guise, R. (2003). Shaping Neighborhoods: A Guide for Health, Sustainability and Vitality. London and New York: Spon Press. Chapman, D. (2005). Creating Neighborhoods and Places in the Built Environment. (Sh. Farvadi & Tabibian M., Trans.). Tehran: University of Tehran Press. Dargahi, M. (2011). The Relationship of Identity and Leisure Time Considering the Neighborhood Sub-Cultures. Unpublished M. Sc. Thesis, Social Sciences Faculty, University Of Tehran. Falamaki, M. (1988). Farabi and the Evolution of Citizenship in Iran. Tehran: Noghreh Press. Falamaki, M. (1996). Restoration of Historical Buildings and Cities. Tehran: University of Tehran Press. Gharai, F. (1999). Generic Principles of Neighborhood Design, With Particular Reference to Tehran. Unpublished Ph.D. Thesis, University of Sheffield, Department of Architectural Studies. Gharavi Alkhansari, M. (2004). Design of Chizar Community School. Unpublished M.A. Thesis, Faculty of Fine Arts, University of Tehran. Gharavi Alkhansari, M. (2005). Community School, a Role-Model for School Functioning In Community. Organizing Community. HONAR-HA-YE-ZIBA, 21. Gharavi Alkhansari, M. (2006). The Neighborhood Concept: Proposing a Guideline. Soffeh, 43. Guest, A., Lee, B. (1984). How Urbanites Define Their Neighborhoods. Population and Environment, 7, 32-56, Human Sciences Press. Hamidi, M. (2007). The Structure of Tehran. Tehran: Tehran Municipality, Technical and Constructional Deputy. Houghton, G. & Hunter, C. (1994). Sustainable Cities. London, Regional Studies Association. Jacobs, J. (2007). Death and Life of Great American Cities. (H. Parsi & A. Aflatouni, Trans.). Tehran: University of Tehran Press. Khaksari, A., Shakiba Manesh, A. & Ghorbanian, M. (2009). Urban Neighborhood in Iran. Tehran: The Human Science and Cultural Studies Research Center. Lang, J. (2004). Creating Architectural Theory. (A. Einifar, Trans.) Tehran: University of Tehran. Lang, J. (2007). Urban Design. (H. Bahreini, Trans.) Tehran: University of Tehran Press. Latifi, Gh. & Safari Chabok, N. (2012). Reproduction of the Neighborhood in Iranian-Islamic Cities according to New-Urbanism. Urban Studies Journal, 7, 3-12. Lynch, K. (1997). Good City Form. (H. Bahreini, Trans.). Tehran: University of Tehran Press. Majidi Khamene, B. & Kolivand, H. (2012). Analysis of Spatial Structure of Urban Neighborhood according to Community-Based Sustainable Development. Amayesh Journal, 19, 47-74. Oryan, M. (1995). Islamic Cities. Transaction of the Conference of the History of Iran’ Architecture and Urbanism, Arg-E-Bam, Second Volume, 278-304. Pakzad, J. (1986). Identity and Unifying With Space. Soffeh, 21-22. Papoli Yazdi, M. H. (1987). The Internal Divisions of Iranian Cities and Their Official Problems, Case Study: Mashhad. Geographical Researches, 5, 5-25. Pars Vista Consulting Engineering. (2002). Per Capita Utilities for Urban Services. First Volume. 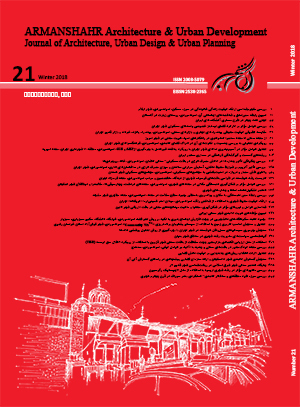 Tehran: Publication of Municipalities Organization. Parsi, F., Mansouri, K. & Badri, N. (2011). Investigating the Social Structure in the Structure of Iranian Cities and the Role of Neighborhood as the Social System of Forming the Qajar Cities. The First International Conference of Islamic Architecture and Urbanism, Tabriz: University of Islamic Art of Tabriz. Rahnamaee, M., Ghalibaf, R., Hadipour, M. & Khatoon, H. (2007). The Changing Process of Structural and Functional Dimensions of Neighborhood. Geography Journal, 12-13, 19-43. Samadi, M. (1993). A Study about Urban, Regional Divisions. Unpublished M.Sc. Thesis, Faculty of Fine Arts, University of Tehran. Shariatmadar, H., Jalali, A. & Ghaffarian, M. (2013). The Reflection of New Theories of Urbanism in Redefinition of Neighborhood Consideration the Sustainable Development. Payam-E-Mohandes, 60, 77-89. Smithson, A. (Ed.) (1968). Team 10 Primer. London: the MIT Press. Sobhani, A. (2006). The Reproduction of Neighborhood Concept from Past to Today. Unpublished M.Sc. Thesis. Faculty of Fine Arts, University Of Tehran. Soltanzade, H. (1983). The Formation Process of City and Religious Centers in Iran. Tehran: Agah Press. Soltanzade, H. (1986). The History of City Urbanization in Iran. Tehran: Amir Kabir Press. Soltanzade, H. (1991). The Urban Space in Historical Textures of Iran. Tehran: Office of Cultural Researches. Soltanzade, H. (1992). Entry Space of the Houses in Old Tehran. Tehran: Office of Cultural Researches. Tavassoli, M. (1986). Principles and Techniques of Urban Design in Iran. Tehran: Ministry of Housing and Urbanism. Turner, J.F.C. (1976). Housing by People, Toward Autonomy in Building Environments. London: Marion Boyars. Zamani, B. & Shams S. (2014). The Necessity of Neighborhood Approach in Restoration of Historical Areas of Cities. Haft-Shahr, 45-46, 72-93.